The Knights varsity football team kicked off its season with a hard-fought victory on Friday, August 27, winning 20-14 against the Washington Bulldogs. The team struggled at the outset, going into halftime down 7-0. During the break, however, Grady’s new head coach Earthwind Moreland instilled new-found morale in the team. “We’ve got to fight pressure with pressure,” Moreland said. Washington was not done putting on the pressure quite yet, however, scoring another touchdown in the beginning of the third quarter to extend its lead to 14-0. With just over 2 minutes left in the third quarter, the Knights demonstrated that they took Moreland’s words to heart, as senior Tyri Jones recovered a Washington fumble and galvanized momentum. Finally, the Knights were able to break the Washington front and put themselves on the scoreboard as sophomore quarterback Caylin Newton bulldozed through the defensive line and into the end zone. The Knights continued to dominate in the fourth quarter, tying the game up at 14-14 with a pass to junior Keenan Marr. Grady quickly regained possession, as senior Amyr Smith snagged a Washington fumble. With just over 6 minutes left on the clock, Newton connected with senior receiver Colin Bray on a long pass for the go-ahead touchdown. Despite the the new lead, however, the Knights were not safe yet. With 2 minutes left, the Bulldogs had a first down on the Knights 5-yard line. Play after play, the Grady goal-line defense prevented Washington from converting the drive into points. Finally, the Bulldogs were faced with a fourth down on the 2. With every spectator on the edges of their seats, the Knights stopped the threat and cinched the 20-14 victory in front of a roaring stadium. 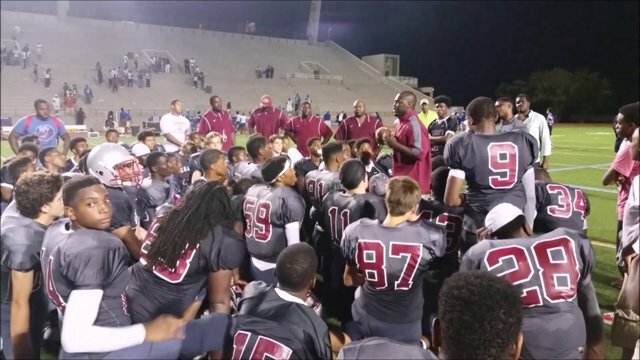 After the game, Moreland, who graduated from Grady in 1995 and played for multiple NFL teams prior to coaching at Grady, gave the game ball to first-year principal Timothy Guiney in celebration of their combined first win.